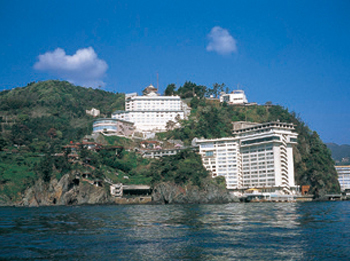 Built on a promontory in Nishikigaura, Japan’s foremost scenic area, Hotel New Akao Royal Wing affords views of the sea from every room. The room is spacious as 40 square meters and comfortable designed to accommodate the preferences of women. The large garden measuring 825,000 square meters allows visitors to experience the sights and scents of the garden with an international flavor. The lobby and corridors adorned with flower arrangements are perhaps evocative of art galleries. While listening to the harp concert, guests can sip some herbal tea in the lounge. Of course, this facility is also fully equipped with open-air onsen baths. 8 minutes by taxi from JR Atami Station. 10 minutes on bus from JR Atami Station bound for Ajiro Asahi-cho. Get off at Nishiki-ga-ura and 3 minutes walk.